The 2011 Traxxas TORC Series presented by AMSOIL landed at Charlotte Motor Speedway for two rounds of hard-fought off-road racing action. Ricky Johnson set the tone early in the Pro 4×4 class as he dominated Friday’s race for a comfortable win. Behind Johnson, AMSOIL Super Team driver Scott Douglas engaged in tough battles with Johnny Greaves and Mark Jenkins before cruising to the second-place podium. Jenkins took third. On Saturday, Greaves and Johnson squared off in what has been called the best Pro 4×4 finish in the history of the TORC Series. Johnson landed on Greaves’ roof as he was trying to pass, but could not find his way around the defending champion and settled for second. Meanwhile, Douglas and Jenkins found themselves in a fenderto- fender rematch, with Douglas gaining the upper hand en route to the third-place podium. In Friday’s Pro 2wd final, Bryce Menzies grabbed the holeshot and the early lead ahead of Rob MacCachren and Scott Taylor. As the laps wound down, Menzies and MacCachren separated from the pack and found themselves in a serious battle for the win. MacCachren finally cruised to victory when Menzies’ engine stalled, and with only four trucks remaining by the final lap, Taylor took second and Jeff Kincaid third. Back with a new motor, Menzies dominated Saturday’s race, leading wire-towire for the win. 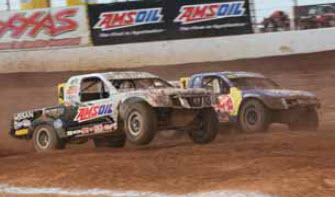 MacCachren took second and AMSOIL Super Team driver Chad Hord finished third. The Pro Light class saw defending champion Casey Currie hold off a hard-charging Samuel Hubinette to take his first win of the season; Andrew Caddell held off RJ Anderson to take the third and final podium position. Currie earned a second straight win on Saturday, while Caddell charged through the pack from last place to take an impressive second-place podium. AMSOIL Super Team driver Brad Lovell rounded out the podium in third. The intensity from Charlotte carried into the next two rounds of TORC action at Bark River Raceway in Bark River, Mich., where Johnson and Greaves raced bumper-to-bumper before the two trucks touched in mid-air, knocking Johnson out. Douglas and Mike Jenkins, meanwhile, jostled for second, with Jenkins finishing on top after Douglas missed a shift. Douglas finished third. On Sunday, Douglas and Greaves quickly jumped out from the pack before contact led to a flat rear tire and broken front differential on Douglas’ truck. Entering the hot pits during the mandatory caution put Douglas at the back of the field. Upon the restart, Greaves and Johnson found themselves in yet another close battle. Missing several chances to pass Greaves over the final three laps, Johnson made a final, aggressive charge on the second-to-last turn. The contact pushed Greaves to the wall just 100 yards from the finish line, and Johnson went on for the win. Mark Jenkins, Mike Jenkins and Douglas finished second, third and fourth respectively. Menzies earned his second Pro 2wd victory in a row on Saturday. Kincaid finished second; Hord picked up the pace after a mediocre start to catch and pass Taylor and Marty Hart for the third-place podium. On Sunday, Hord jumped out front early before losing his steering and striking the backstretch wall. Hart and Menzies also wiped out, and after a red flag delay, Kincaid took the win, followed by Keith Steele and AMSOIL Super Team driver Mike Oberg. Caddell pulled the holeshot and picked up the victory in the Pro Light class. Hubinette finished second, followed by Luke Johnson in third. Sunday’s action saw Hubinette win a close bumper-tobumper battle with Caddell, who finished second. CJ Greaves finished third. 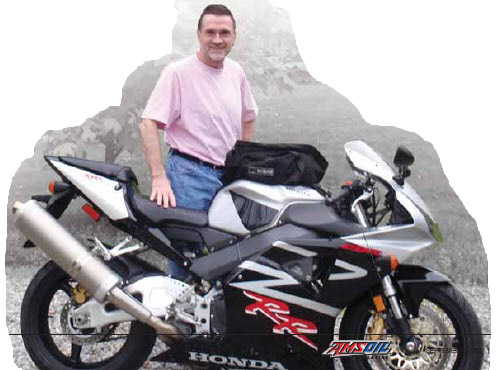 AMSOIL is the Official Oil of the Sturgis, Daytona and Laconia motorcycle rallies. 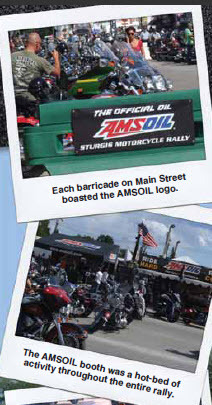 The Sturgis Motorcycle Rally took place just last month, and a few corporate employees received the opportunity to promote AMSOIL products in the corporate booth on Main Street. A concentrated effort was made to ask customers who stated they were already using AMSOIL in their motorcycles if they also used AMSOIL in their cars, trucks or other types of equipment. Approximately 95 percent of these customers said “No.” Do you know what that means? Opportunity! Go to your current customers and find out more about their lubrication needs. If you’re selling someone motorcycle oil, odds are he or she has a car, or two or three. Those vehicles need AMSOIL. A customer who only uses AMSOIL in his or her snowmobile or four-wheeler often has a truck and trailer that would also benefit from the use of AMSOIL products. Your current customers are easier to sell to compared to those who haven’t yet experienced the benefits of AMSOIL products. Let your current customers know the same quality and performance they receive with their current product is consistent throughout the entire AMSOIL product line. If they like the performance they realize with AMSOIL Synthetic Motorcycle Oil, they will love the performance they receive from AMSOIL synthetic motor oils. And don’t forget to ask them for a referral, perhaps a family member or friend they ride with who could also benefit from using AMSOIL products. After taking two championships last year at the Red Bull AMA Amateur National Motocross Championships presented by AMSOIL at Loretta Lynn’s Ranch, Team AMSOIL amateur motocross rider Justin Bogle entered this year’s event looking to add to his collection. And he did. Bogle dominated the 450 A class, sweeping all three motos for the championship. With one title under his belt, Bogle set his sights on another in the 250 A class. After finishing second to Kyle Peters in the first moto, Bogle edged Peters in the second moto to set up the winner-take-all third moto. Peters took the early lead and led the entire race as Bogle concentrated on chasing him down. Entering the final laps, Bogle laid the pressure on Peters, who started getting caught in lapped traffic. Both riders were forced to make alternate line choices in the most crucial point of the race. Although Bogle closed in, he couldn’t complete the pass in time and took second. Bogle capped off his amateur career by earning some prestigious hardware at the AMA Amateur Nationals closing ceremonies. Following in the footsteps of former Team AMSOIL rider Trey Canard, Bogle was presented with the AMA Horizon Award, awarded annually to an amateur racer poised to succeed at the pro level. Bogle also earned the Vurb Cup, presented to the rider with the best average moto finish at Loretta Lynn’s. Bogle finished first or second in all six of his motos; he joins new pro teammate Eli Tomac as a winner of the Vurb Cup. Bogle made his professional motocross debut with Team Geico/AMSOIL/Honda at the Unadilla National in New Berlin, N.Y. on August 13. he’ll compete in the final four events of the 2011 AMA Motocross season. Thousands of metrics can be called upon to see how valuable a sponsorship is to a company. I don’t want to get into all of them here, but paying attention to how other companies advertise is one way to gauge how much exposure AMSOIL is receiving. I was recently at the AMA Amateur Nationals presented by AMSOIL in Tennessee. It was easy to see how well the company’s relationship with the Factory Connection team was paying off in the form of “piggyback” advertising. Thor, a major sponsor of the event, used images of several AMSOIL riders, including top amateur Justin Bogle, in its on-site signage. Moto Playground is a leading amateur motocross magazine and brings thousands of August issues to Loretta’s. 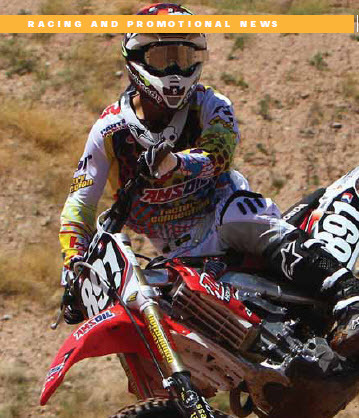 Just inside the cover were not one, but two, full-page ads featuring AMSOIL pro riders Justin Barcia and Eli Tomac. Companies like Fox, Geico and Dunlop place ads year-round that feature highly visible AMSOIL logos. The great thing about this advertising is that there is no direct cost to AMSOIL. It’s simply an added bonus to sponsorships that already produce great results. The National Oil & Lube News (NOLN) 2011 “Tops in the Industry Ranking” indicates the U.S. quick lube market is growing at a healthy rate. In fact, the report shows the first growth in the market in over three years, climbing by 185 stores to a total of 16,716 over the past year. With the number of new-vehicle dealerships declining over the past few years, quick lubes have picked up the extra oil change market share. 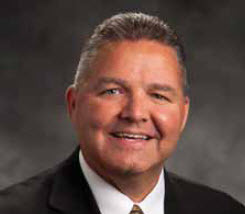 NOLN estimates U.S. quick lube sales will increase by $100 million in 2011, reaching more than $9 billion. With 60 to 70 percent of motorists choosing to pay someone else to change their oil, and that number expected to reach 80 percent by 2018, the quick lube market is expected to continue growing for the foreseeable future. Increased private investments have allowed quick lubes to expand at an aggressive pace. “I don’t think they would have had that much private equity money growing into it if investors didn’t believe in it and in the future of it,” said NOLN Editor Garrett McKinnon. Now is the time to capitalize on the growing installer market. Both AMSOIL OE and XL synthetic motor oils are geared for independent installer accounts, allowing them to increase profits by offering OEM recommended drain intervals with OE, extended drain intervals with XL or both. This month’s column has been a little tougher to write than usual. It focuses on one often-unpopular word: Attitude. There, I said it. It is unpopular simply because most people don’t want to inspect this trait in themselves to see how their attitude appears to others. Many people become defensive and feel that their attitude is great, even though others would disagree. But, if you want your attitude to remain positive, you need to inspect and work on it every day. It will affect your ability to grow your business; that is evident in the many emails and phone calls the Dealer Sale Department receives from Dealers across North America. As you know, the lubricants market has been very volatile as of late and product prices have increased for all lubricant companies (some more than others) over the last four to eight months. This is where attitude kicks in. We have had Dealers call to inform us that they are having record sales years, that the price of AMSOIL is extremely competitive, they are happy our prices have increased fewer times than the competitions’ and that greater acceptance of our products’ extended drain capabilities has their business going gang-busters. Sales are great; keep up the super job of supporting the Dealers. Of course, we love getting phone calls like those. On the flip-side, we have also received emails and phone calls from Dealers informing us that their business is down, that prices are too high, shipping is too costly and should be free and that selling AMSOIL is too tough. One Dealer even went as far as to say he could sell a pound of dirt to an earthworm, but he couldn’t sell AMSOIL. What is the difference between these calls and the calls received from those whose AMSOIL business is growing? Yep, that one dirty little word: Attitude. This is not something new. Henry Ford said it best: “If you think you can, or if you think you can’t, you are probably right.” Look at maintaining a positive attitude as you would maintaining personal hygiene. If you want to keep clean, a daily shower is recommended (and your family and friends will appreciate it). If you want to have a positive attitude, it is recommended that you work on it on a daily basis. Read all you can about having a positive attitude. If you enter the words “positive attitude” into the amazon. com search function, it returns a list of 580 books on the topic. I happen to like Jeffery Gitomer’s book, “The Little Gold Book of YES! Attitude: How to Find, Build and Keep a YES! Attitude for a Lifetime of SUCCESS.” This book will cost you about $11 plus shipping (Hint: did you notice shipping is not included in the price of the book?). I would say that is a pretty small investment to start your personal library of books on attitude. That’s right – you can’t read just one book on the subject. Another book I really like that addresses a positive attitude is “The Greatest Salesman in the World” by Og Mandino. This book has been out for years and is a classic that should be in every AMSOIL Dealer’s book collection. I found this quote on attitude and really thought it hit the nail on the head. Remember, your attitude is probably going to be one of the biggest determining factors for your future success in building your AMSOIL business. The Dealers we talk to who have positive attitudes and believe they can, and will, grow and sell more AMSOIL products are doing just that. Those who believe the marketplace is down, things are tough, prices are too high and their business won’t grow are seeing those results. So, of these two Dealer segments, who is right? They both are. Sure, skills, support and values will also play a part in growing your AMSOIL business, but attitude is what you will be known for by your customers. Attitude will determine your altitude in the growth of your AMSOIL business. 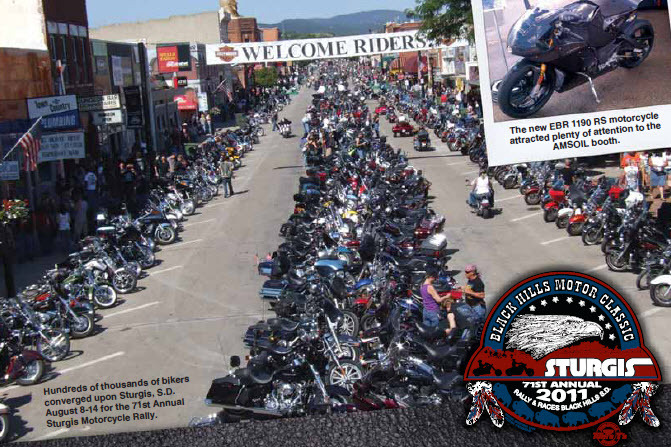 The 71st Annual Sturgis Motorcycle Rally provided outstanding promotion for AMSOIL and AMSOIL Dealers. With outstanding weather for the duration of the rally, thousands of current and prospective customers stopped by the AMSOIL booth to learn more about saving time and money and gaining the best possible protection for their investments, including bikes, cars and trucks. As AMSOIL entered its fourth year as the Official Oil of the rally, the AMSOIL logo could not be missed. The famous Sturgis Main Street was blocked off with barricades for five blocks, allowing only two-wheel traffic, and each barricade featured an AMSOIL sign. AMSOIL visibility on Main Street included a 30-foot AMSOIL trailer and the new EB R 1190 RS motorcycle from Erik Buell Racing. Larger package sizes of AMSOIL Diesel Recovery (DRC) are discontinued and available at reduced prices while supplies last. AMSOIL will not accept returns on these sale-priced items. A two-week lead time is required for 55-gallon drums. 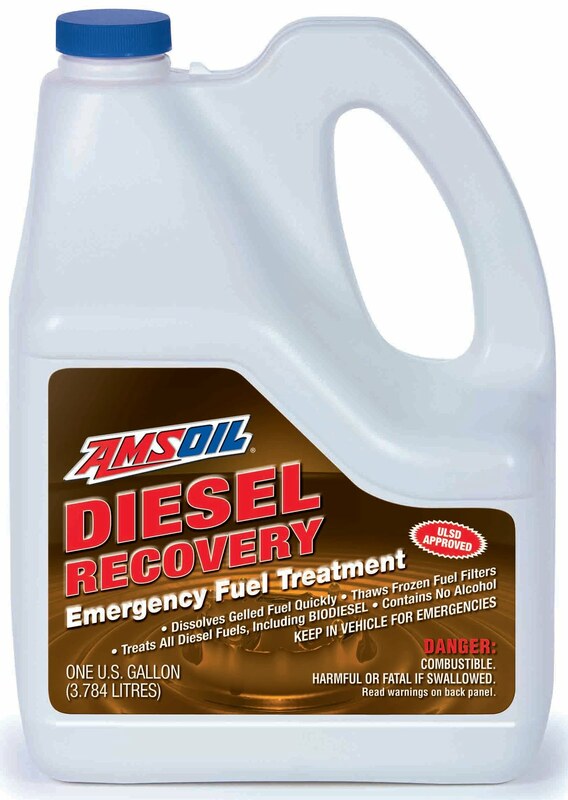 AMSOIL Diesel Recovery remains available in 30-ounce bottles (DRCCN). New AMSOIL Engine Assembly Lube (EAL) is formulated to cling to engine parts and provide exceptional wear protection while inhibiting rust and corrosion in newly built or rebuilt four-stroke engines. It is designed to dissolve in oil, helping eliminate oil port clogging and deposit formation, and represents a premium option for performance enthusiasts, engine builders and race teams. Because building an engine can take from a few days to many months, using an assembly lube that clings well to parts for extended periods is critical. 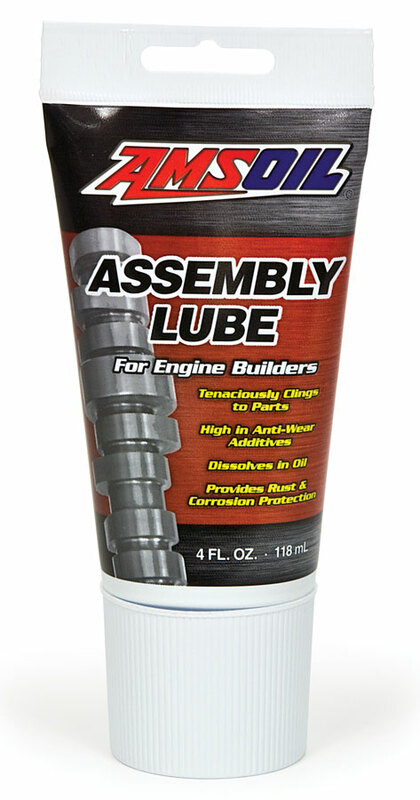 AMSOIL Engine Assembly Lube is formulated with a high-viscosity base oil and a unique tackifier for long-lasting, tenacious oiling. During initial startup, engines operate momentarily with little-to-no oil pressure, placing camshaft lobes, lifters, rocker arms, bearings and other critical parts at high risk of wear and failure. In addition to inhibiting wear by clinging to parts, AMSOIL Engine Assembly Lube contains high levels of anti-wear additives for further protection. 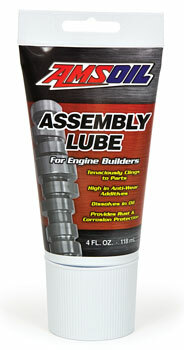 AMSOIL Assembly Lube is packaged in convenient 4-oz. tubes, allowing cleaner, more precise application compared to other products. AMSOIL Engine Assembly Lube is recommended for any new or rebuilt fourstroke engine, including racing and performance engines, and should be applied to all areas of the engine susceptible to initial startup wear.